When my university course invited me to do a two week teaching placement over on Groote Eylandt, I immediately assumed it was some sort of spelling error in the email. But then, once I determined it was a real place and that it was in fact in Australia, with its own culture and unique education system, I was excited to experience all of it. Fortunately, my Uni pal, Mel, also applied to embark on this experience and we got sent over together. We were to be living with primary school teacher Casey, her partner Adrian, and their dog named Wilson. At Darwin airport Mel and I were faced with the harsh truth of us having an inconvenient affection for heavy clothing and traveling with absurd quantities of couscous and body wash. We clawed through our luggage like those angry sweaty people on Border Patrol, plucking out excellent skirts and formidable cardigans in an attempt to get our luggage under the strict 13kg limit. Consequently, leaving us waddling around like sassy blimps wrapped in excellent skirts and formidable cardigans until someone informed us that we could just buy another bag to put our excess stuff in. So we – and more importantly our couscous and body wash – made the flight. We were greeted at the airport by Casey. We chucked our stuff in the back of her car and naturally we headed straight to the Umbakumba Festival. It was dark by the time we arrived. Everything is always scarier at night; particularly in such an unfamiliar place. And especially when it felt like the three of us made up a large portion of the white population. Sticking pretty close to Casey’s side, to an extent that probably made us look embarrassingly keen for friendship, she told us about the festival and her experiences so far on Groote. As we wandered around, we meet some of her students, colleagues and friends along the way. During the festival we gathered with the community and heard some students sing songs that they wrote, watched some Indigenous ladies weaving baskets, spectated local girls playing basketball and even got the chance to eat some turtle. It was an interesting festival and I couldn’t have imagined a better introduction to Groote Eylandt. With each new face and every surprising, illuminating conversation, we already felt ourselves coming to love the place, and longing to discover more. 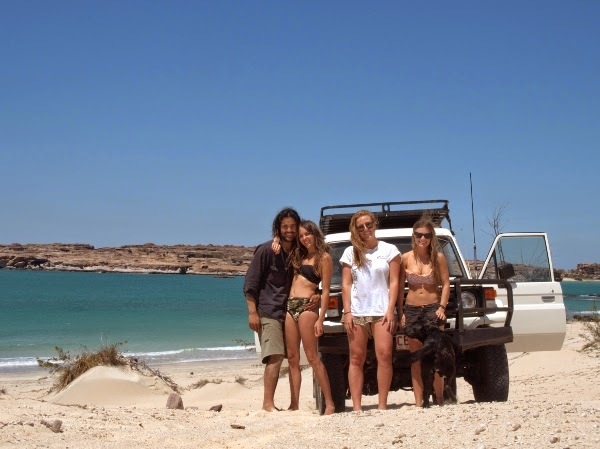 Casey and Adrian were keen to show us around Groote, our adventurous weekends seeing us learn about the rich Indigenous culture, contemporary social customs, and the fascinating lifestyle of the locals. We camped at Jagged Heads one night; the rock formations were incredible, and the clarity of the water permitted some enthralling up-close GoPro footage that enabled us to capture the dramatic life of coral. Sadly, Mel accidentally submerged her GoPro without the protective case on it, so we ate away our sorrows around the campfire – chomping into steaks and roasting marshmallows into the night as we learnt more about each other’s’ lives. In addition to camping at Jagged Heads, we visited the Cave Paintings and numerous beautiful swimming holes. I remember being so amazed, that such beautiful, untouched, picturesque places existed in this remote part of Australia. It was really easy to get along with Casey and Adrian, and they made Mel and I feel really comfortable and welcome in their home. I already miss eating Magnums and watching The Bachelortogether, as Adrian led discussions about Jess being waaaaytoo desperate and how Blake has no personality. Debates on modern romance aside, though, I should probably talk a bit about my school experiences. My first day at Alyangula Area School was initially a bit nerve-racking, but that soon subsided once I met Casey’s wonderful Grade 3 class. Casey ensured that I got involved in class activities straight away. The students were gorgeous, each of them with varying backgrounds and personalities, but uniform in their innocent childish hilariousness. 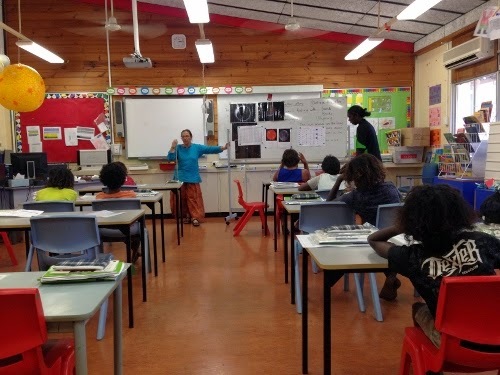 Casey does a brilliant job of including the Indigenous students in lessons and she operates her classroom in a very organised, inclusive, natural manner. A moment of my own learning from Casey that I’ll never forget occurred during a moment of mild stress. While I was planning a lesson on the relationship between fractions and decimals and trying to make it meaningful and understandable (for both the Grade 3s and myself), Casey told me to remember that the kids need to enjoy coming to school, to feel like they belong, and to have a good time as they learn. She taught me that teaching is more than running successful, engaging lessons all day, but helping students to develop and maintain positive feelings towards learning, especially in a remote location with Indigenous students, where attendance is generally quite poor. I am always quite hard on myself, but thinking about this gave me a new perspective towards my own teaching and learning and ultimately, my planning. It may seem like a simple concept, but often it’s easy to overlook simple thoughts and ideas like that. While eventually coming to learn how to pronounce all the kids’ names, and being quietly told by Tioneesha* that her name isn’t Tiosheena, I really enjoyed getting to know them all. It was also amazing to see how far some students progressed in the two weeks that I was there. I found a lot of joy in helping them reach success in their lessons, and witnessing them enjoy their own personal triumphs. I learned so much from Casey and the students during my time at school, especially in regards to behaviour management, planning and running the classroom. Casey was really supportive of me getting in there straight away and teaching the class as much as possible, which I am so grateful for. It was harder than any placement I had completed in Melbourne, the new challenges numbering amongst those of having to plan lessons to cater for the needs of a hugely diverse range of learners, as well as the oddly constant concern of students just making a smooth exit out the classroom door. I am so grateful to Casey for all the knowledge she has passed on to me in such a short time, the passion she has for her work is inspirational and the kids she teaches are so lucky to have her as their teacher. I am also really grateful to various other teachers at each school that were kind enough to take time to share their experiences and knowledge with me. 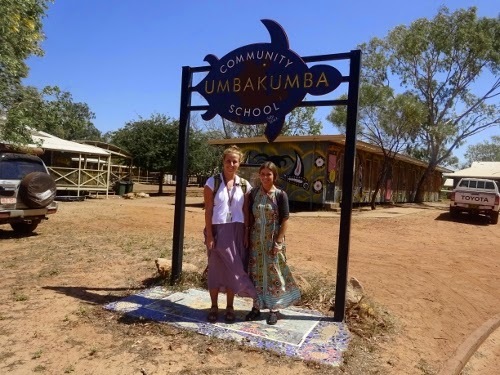 Mel and I also had the fantastic opportunity to visit two other schools during our time on Groote. They were both Indigenous community schools. The attendance rate at these schools are dismal and those who do attend are often being taught classroom behaviour expectations. At Angurugu School, a teacher took us out on the morning bus ride to pick up students from around the community in an attempt to get them to come to school. 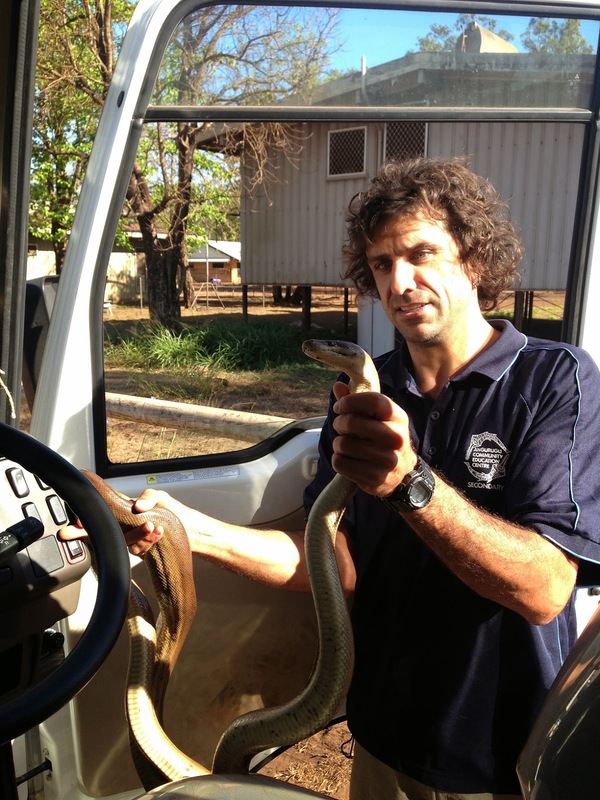 It was an eye-opening, other-worldly experience, a noteworthy morning featuring the teacher entering a student’s home and emerging with a big Olive Python in his hands. That morning about eight students got on the bus. The classrooms were caged and locked, resembling more of a prison than a school from the exterior. We observed several classes throughout the day, and it was really interesting to see how differently the classrooms function from school to school, and how individual teachers ran their classrooms. We observed a session in the FAFT Centre – a program that promotes the concept of ‘Family As First Teachers’. Mothers attended with their little ones in an effort to bridge the gap between school and home life, creating a supportive family environment for students whilst respecting the culture and beliefs of the community. I gained great insight into the programs, facilities and strategies in place in the Indigenous communities. School attendance is obviously a key issue amongst the Indigenous population on Groote. It’s a difficult one to resolve due to the conflicting beliefs present in the culture, and it makes it hard for significant learning and growth to take place at school, consequently slowing the efforts of the school community. Through observing these various classrooms environments and educational programs, we gained tremendous, enlightening insight into remote indigenous education – its successes, its shortcomings, and its challenges. I had the most amazing 18 days on Groote Eylandt. It was filled with many laughs, adventures and opportunities for growth, learning and deeper understanding. I will never forget my time on Groote and the amazing people I got to share it with.